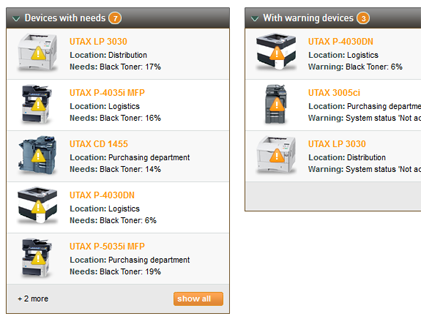 If a system reports an error, or the toner or paper run low, UTAX smart will inform you instantly. Thanks to clearly visible alert messages and customizable e-mail reports no problem will evade you, whether as administrator or dealer – even better: you can act before the output workflow within the company is disrupted and provide a solution for the customer, even before he knows he has a problem. 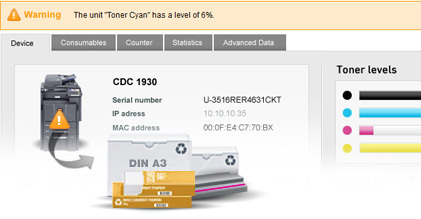 When a system runs out of toner or paper, it is usually too late and operations are disrupted. UTAX smart recognizes bottlenecks in the supply of a system with toner, ribbon, staples or paper early enough and offers the opportunity to re-order suitable consumables within seconds. Automating processes has never been easier.